A Pulitzer prize winning play from one of America’s finest playwrights. Critics called it ‘electrifying and heart rending’. 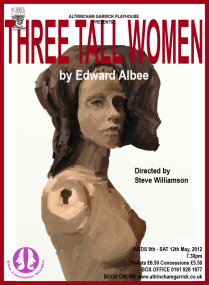 Three amazing actresses give us a portrait of a women, her life, memories and beliefs with unflinching intensity. Like Albee’s play ‘Who’s afraid of Virginia Woolf?’ this play is full of humour and truths all delivered in an elegant, engaging and shockingly truthful style.